TALLAHASSEE, Fla. – The Florida State women’s tennis entered the 2016-2017 season with a host of fresh faces and a number of young freshmen joining the fold. Though inexperienced, the Seminoles reached new heights as a team and individually en route to a ninth NCAA Championship appearance in 11 seasons and 10th overall under head coach Jennifer Hyde, capping the year with the team’s first NCAA tournament victory in three years. Senior Daniela Schippers led the Seminoles as one of two upperclassmen on the squad, and for her efforts was named the ITA Most Improved Senior in the Southeast Region following the season. On the year, Schippers racked up 11 singles victories while holding a staggering 18-3 record in doubles. Schippers’ doubles performance allowed the Noles to win a program-record 20 doubles points in 2017, including six straight to end the season and advance in the NCAA Championship. The honor is the second in program history following Daneika Borthwick’s award in 2015. Schippers and junior Gabriella Castaneda combined to open the season 13-0 in doubles before finishing the season with an impressive 16-2 record as a pair. Despite missing a handful of matches due to injury, her performance and emotional leadership earned Castaneda third team All-ACC honors at the conclusion of the season. The award is the second for Castaneda after also claiming third team honors following her freshman season in 2015. After an up-and-down start that included a home victory over No. 26 NC State, the inexperienced Noles reeled off a midseason six-match winning streak to put themselves in position for a return to the NCAA Championship. The streak began with a shutout victory at Louisville and included another impressive sweep against No. 28 Notre Dame, both broadcast nationally on ACC Network Extra. The Seminoles also took down Pittsburgh, Boston College, Syracuse, and Florida A&M during the winning stretch. After splitting the final weekend of the regular season at Virginia and Virginia Tech, Florida State entered an ACC tournament rematch with the Cavaliers likely needing a win to ensure an NCAA invite the following week. 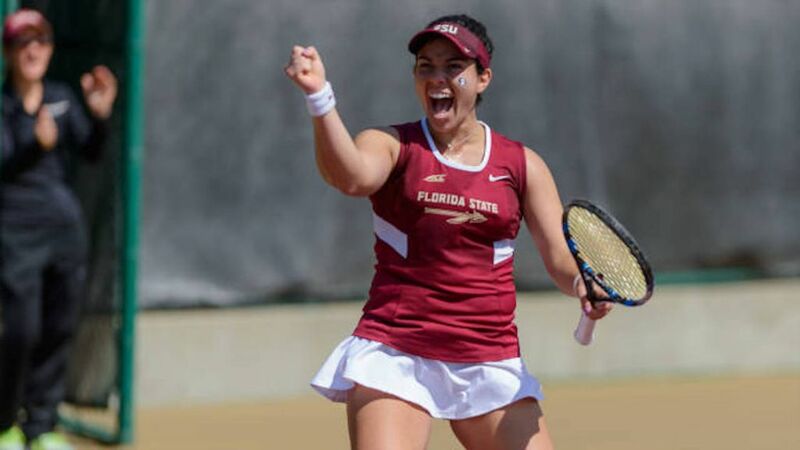 The Noles went up 3-0 in the match, and freshman Andrea Garcia won 6-0, 3-6, 6-2 to clinch the match at 4-2 and seal NCAA tournament hopes for the Seminoles. In the NCAA Championship, FSU entered the Auburn Regional as the three seed, facing No. 26 Arizona State in the opening round. The Seminoles defeated the No. 68-ranked doubles pair for the Sun Devils to take the doubles point, but fell down 2-1 in the match. Castaneda earned her first singles win in two months, downing the No. 50 player in the nation for her 50th-career singles win and help lead the Noles to the NCAA Second Round for the first time in three seasons. In the second round matchup with host No. 11 Auburn, the Seminoles came up just short despite leading late in the match, but this season was one for the record books for such a young, promising team. In the fall season, freshmen Nandini Das and Andrea Garcia, who would start every match on the year, got their first taste of college tennis at the Furman Classic. The team played in an ITF tournament at Hilton Head, S.C. and in the prestigious Bedford Cup competition the following week, where Schippers and the pair of Das and sophomore Ariana Rahmanparast claimed consolation doubles titles in their respective flights. In November, Florida State hosted the first-ever Seminole All-Conference Showdown, hosting schools from five major conferences from around the country. Schippers, Garcia, and Das claimed singles titles on the weekend to give the Noles three of four possible singles flight victories to wrap the fall season. 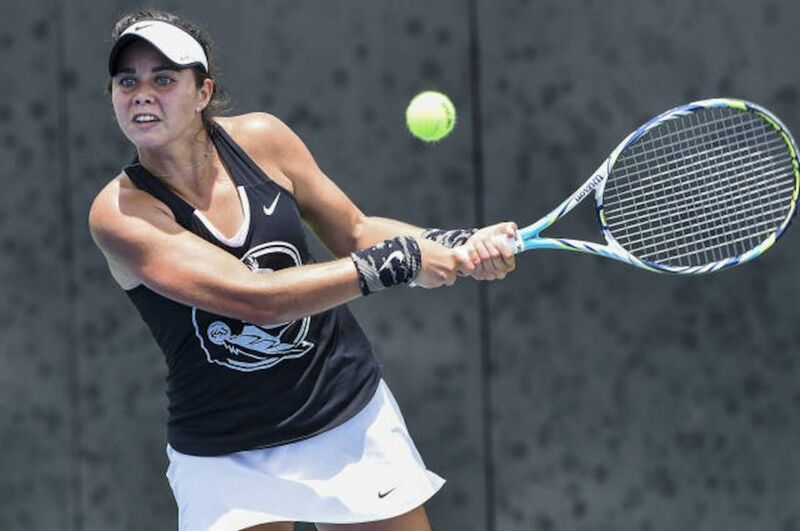 In the spring, two more freshmen entered the fold in French international Carla Touly and Gabrielle Goldin, a walk-on from Bradenton. Goldin saw action in six matches on the season, including a clinching victory over FAMU in her first career appearance in Garnet & Gold. A fixture at the No. 2 spot and even playing at No. 1 at times throughout the year, Das figures to provide a strong one-two punch at the top of the lineup next season, while Garcia became a key player on court five, winning eight of nine matches to close out the regular season. After an incredible showing in doubles, all three Seminole doubles teams appeared in the final ITA rankings –Garcia/Mikulski are ranked No. 65, Schippers/Castaneda come in at No. 81, and Das/Rahmaparast are tabbed at No. 82 in the nation. 2017 marks the first season in program history that all three doubles teams finish the season in the ITA poll. As a team, the year-end ranking of 30 in the country is the highest final ranking since the 2013 season, when the Seminoles ended the season at No. 21 nationally. Against North Carolina, sophomore Julia Mikulski took down the No. 4 player in the nation in three sets. The win catapulted the Essen, Germany native into the ITA singles rankings, where she stayed for the rest of the regular season and into the ACC tournament, topping out at No. 103 in the country. The Seminoles return all but one player from this year’s NCAA tournament team and with the addition of another strong recruiting class, Coach Hyde has the Florida State program primed for future NCAA Championship success.